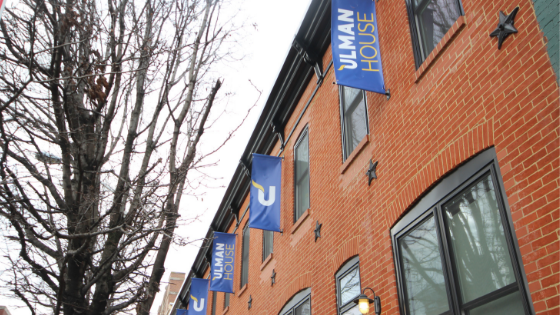 January 18, 2019, Baltimore, MD The Ulman Foundation officially opened the doors of Ulman House in East Baltimore last week. Ulman House is a hospitality home built specifically for adolescent and young adult cancer patients and their caregivers seeking treatment in Baltimore and is the first of its kind in the State of Maryland. Ulman House at 2118 E Madison Street in the Eager Park community of East Baltimore is a 12,000 square foot facility that has 8 family suites and is estimated to serve 200 patients each year. The home also features many communal spaces for the residents including a large kitchen, living room, fitness center, music room, and rooftop deck to allow natural connections between residents. The home is a unique renovation project consolidating and redeveloping six historic row homes into a state-of-the-art facility that has submitted for Gold LEED certification. Approximately 72,000 young adults are diagnosed with cancer each year, with about 3,000 cases in the state of Maryland. Many hospitals in Baltimore see patients traveling from neighboring states to seek treatment and their options for housing are limited because of the age group (15-39). Ulman House with serve patients between the ages of 15 and 39, who are actively in treatment with multiple appointments a week, and live 35 miles or more away from their treatment location. Ulman House is currently accepting referrals for patients and seeking volunteers to assist in meal preparation and activity hour. For more information please visit www.ulmanfoundation.org/ulman-house/.